I'm gonna tell you what it is and what it isn't. Closure is the Great Value version of the word catharsis, the process of releasing, and thereby providing relief from, strong or repressed emotions. Closure is not something that you can force someone to give you, and it is not a means for reconciliation. Closure is simply an ending to a hard time. Experiencing closure is a nice, but uncommon experience. People are generally too lame to admit their wrongdoings. Not your fault! A person willing to engage in a cathartic conversation is basically burning themselves at the stake as an act of goodwill towards you, so even if it may not seem like it, accept the sacrifice. There are far too many people who would rather let you pick up the pieces by yourself. But I deserve closure! You might, depending on the situation, but how often do we really get what we deserve? Exactly. Essentially, it's when you have hope that your situation will change that you've messed up. 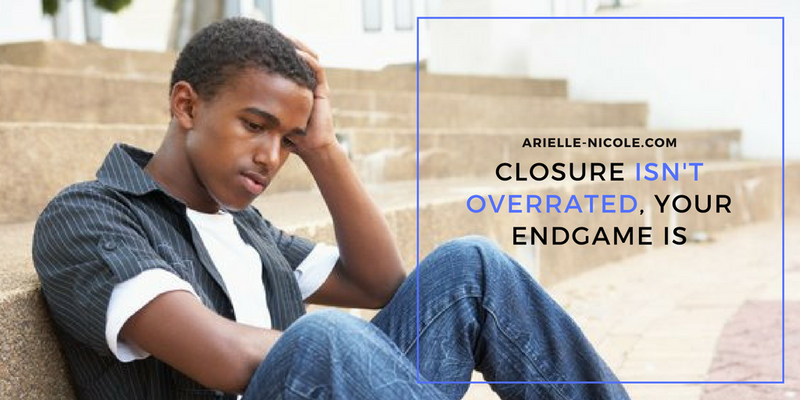 Seeking closure is only dumb when you want anything more than information, or when your problem person isn't done screwing you over. If you go into a conversation with a spirit of reconciliation, or you reek of vulnerability, guess who's gonna get played? Closure only helps those who are determined to let go, no matter what the problem person says. You're not there for apologies! You're not there to reunite! Just get the answers to your questions and go! But Ari, what if we have a conversation and I feel worse than I did before? Life's too short to dwell on whether or not you got to tie up some loose strings. If you've had a chance to confront your problem person through a cathartic conversation, good for you. If the opportunity never arises, that's okay too. Sorry kid, you've still got to move on. Aight, get outta my face now; I'll be back next week.